Polka Dot Pals is a 4×6 stamp set that includes a total of 17 stamps and will sell for 15$. I apologize that the image I used on this card is digi and the sentiment is from Hero Arts. Jessica had sent my stamp set off last week, but, unfortunately it have not been delivered to me yet. It is the reason why I had to use digital image for today. Japan is so far from the US. :( But I feel so happy that I can work as a member of the TSG team though I live in such a far place! 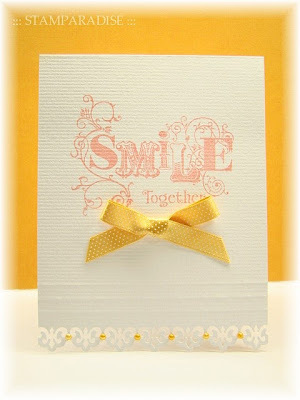 I promise you that I will share another card using my "real" stamp set in a few days. 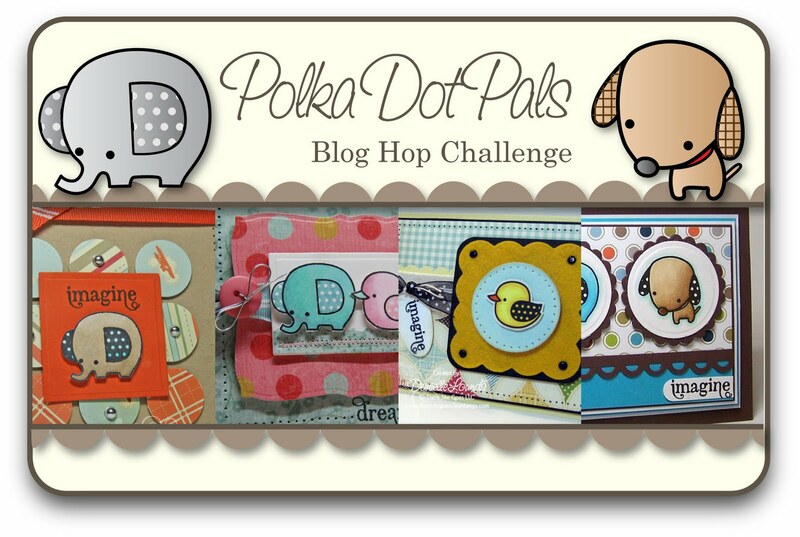 Would you like a chance to win the Polka Dot Pals stamp set? Here's what you need to do - go to each of the Trendsetter's Blogs and leave a comment on their Polka Dot Pals Blog Hop Challenge post. After you have finished checking out the eye candy and have left some love, return to the TSG blog and add your name to the Mr. Linky at the bottom of this Blog Hop Challenge Post. 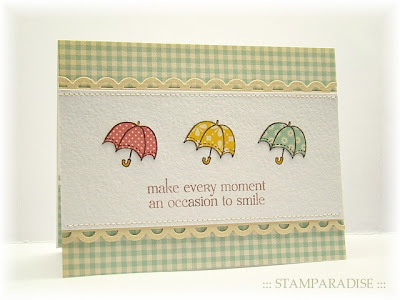 A winner will be chosen randomly using a random number generator to receive their very own Polka Dot Pals stamp set. The winner will be announced Saturday (June 26th) during the Release Party Chat. Have you enjoyed all the sneak peeks? My blog is the end of today's hop. Please head back to the TSG blog and add your name to the Mr. Linky! This card was used the sketch from this weeks Mercy's Tuesday Sketch Challenge (MTSC 79). 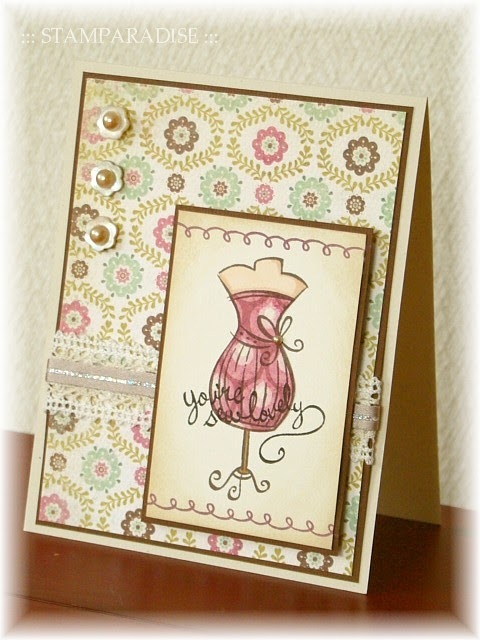 I used a lovely dress form stamp from Sew Lovely set for the focal image. 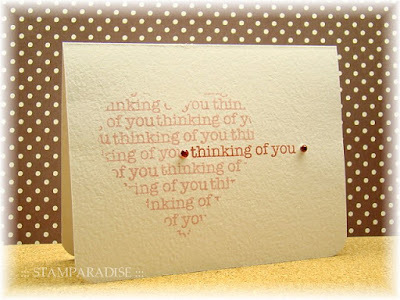 The swirly line and sentiment are from the same set. I stamped the image with Espresso ink (Versa Craft) , colored with Copic Markers and paper pieced for the dress. The all edges of the focal panel were sponged with Antique Linen ink (Distress ink). For embellishment, I added some shell buttons with peals, lace and ribbon. This card was used the FTL95 sketch . I made the fabric flower by using Petit Scalloped Circle Nestabilities (Spellbinders). 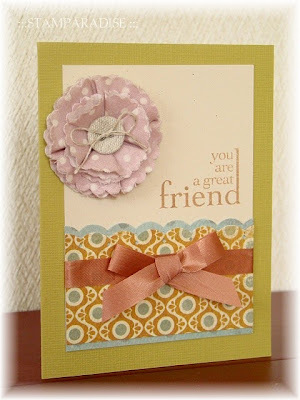 I really like this flower because it is easy to make and gives my card a touch of softness. There She Goes Clear Stampsのイラストレーターとしてお仕事させていただくことになりました!!! I'm so excited and thrilled to share with you a BIG news today! I'm extremely honored to work as a illustrator for There She Goes Clear Stamps!!! 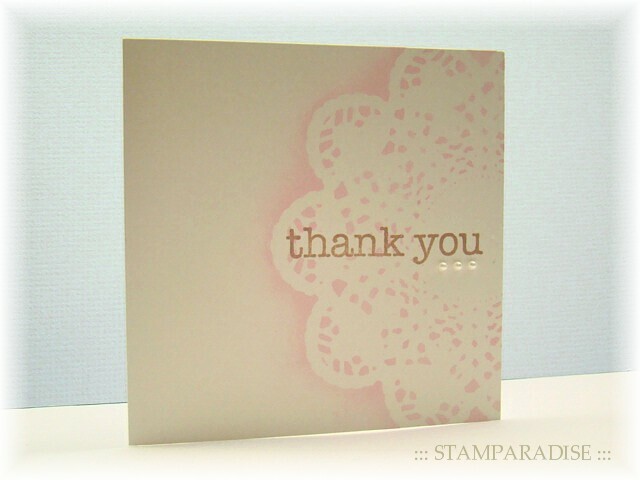 I was so surprised when Jessica, the owner of TSG, contacted me and asked if I would work with her. But it was good timing for me. 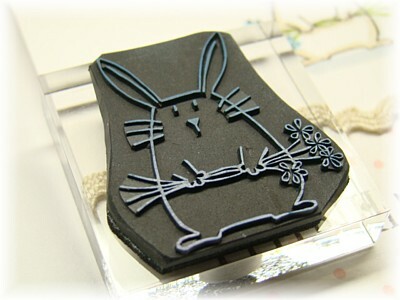 Honestly, I was getting tired to carve many stamps for sale, and thinking about making my designs into machine made rubber stamps. So I said "YES!!" 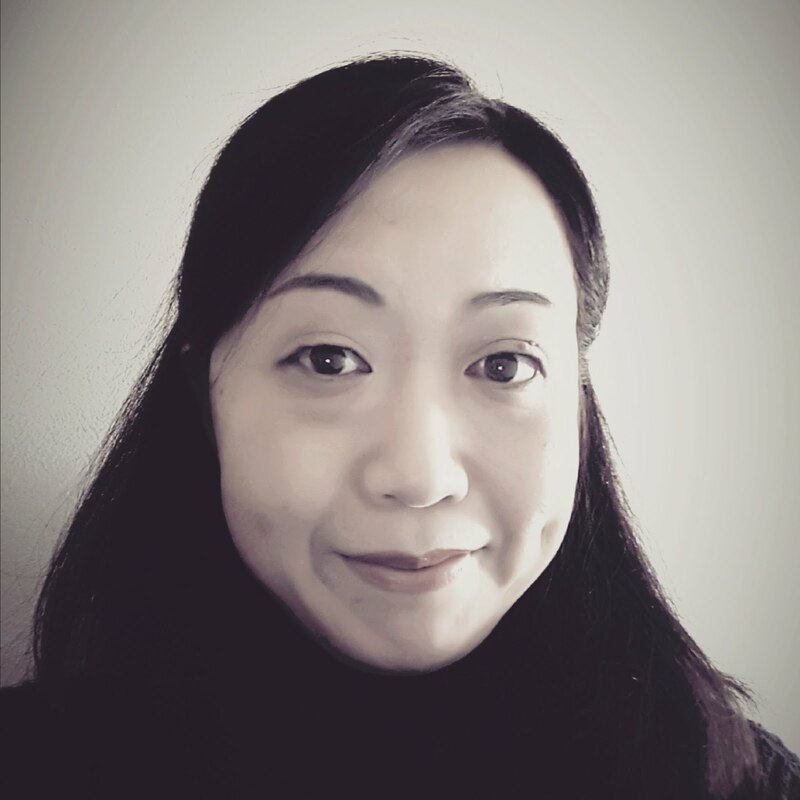 :) The only thing I worried about was whether I am able to communicate with her in English. But she said I didn't need to worry about it. She is always so kind to me and encourages me. It is such a pleasure working with her! Hello everyone! This card is for the One- layer Wednesday Challenge 9 (OLW 9). This weeks challenge is to use at least one flourish. As soon as I knew it, I thought of this stamp which is from Technique Tuesday. I don't remember when I purchased it... maybe over a year ago. But it had never been inked. What a poor stamp!! Don't cry, Susan gave you a great opportunity to be a leading actress!! LOL! I'm very satisfied with the result. This color combo is so pretty, isn't it? I think she (I mean the "poor stamp") also is pleased with it. Accessories: Ribbon (American Crafts), Pearls (Kaiser) *They were colored with Copic Marker. A few days ago, I saw a beautiful CAS card which was used only kraft and black while I was playing on the Internet. (Sorry, I don't remember where I saw it.) That was so elegant and I thought I have to try to make my version. I had not carved new stamp for a while since I had nothing to want to carve. But, I was in the mood that wanted to carve something new yesterday. I dragged past sketchbooks out, and found this chubby rabbit which was drawn over six months ago. 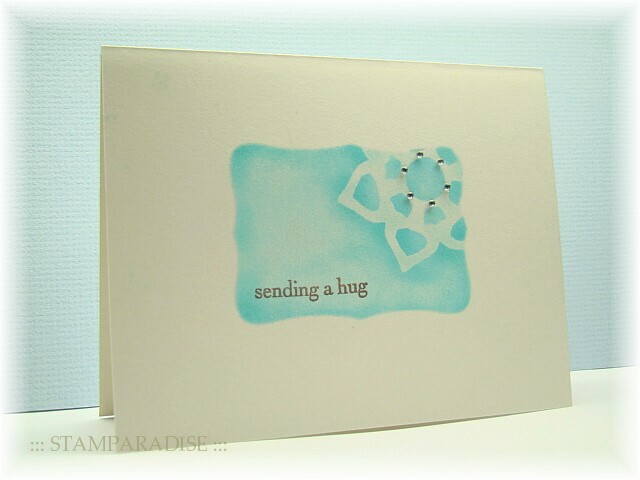 Here is a card I made using my new stamp. I went with one layer card again. I stamped the image with Espresso ink (Versa Craft) and lightly colored with Copic Markers. The Polka Dot background stamp (Hero Arts) was stamped onto lower part of the cardbase with Pixie Dust ink (Versa Magic). I added some rick rack tape and a button for embellishments. 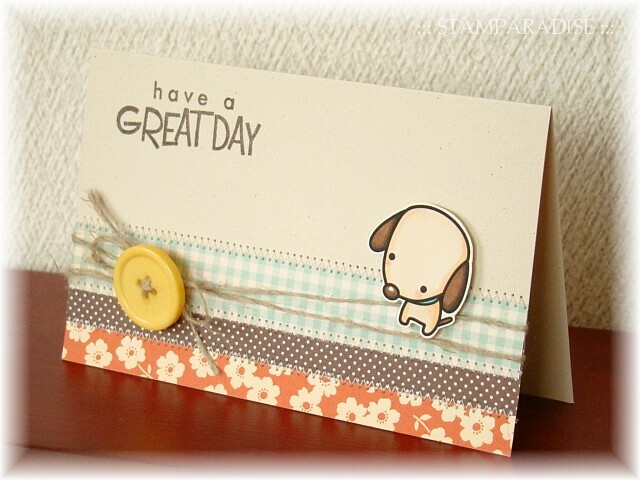 I've made two CAS card for this weeks One Layer Wednesday Challenge (OLW 8). This weeks challenge is to make a mask and use it to create a background. When I saw this challenge, two ideas for a mask had popped into my head immediately. 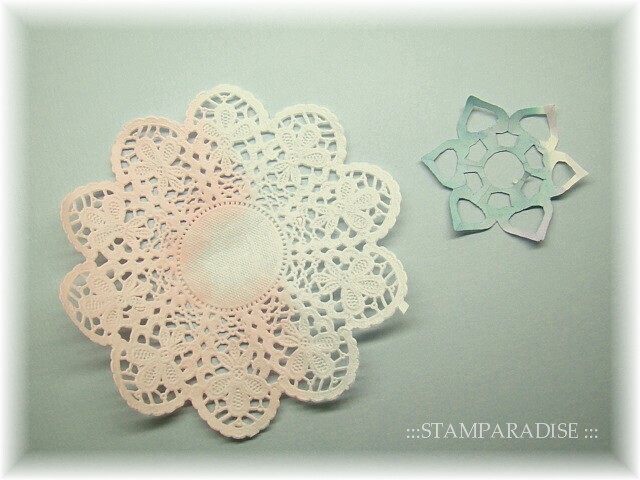 One was a lace paper and another was Kirigami. Do you know Kirigami? Kirigami is a variation of origami. 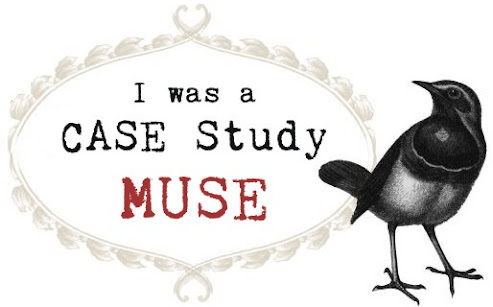 You can get more info about it HERE, if you are interested in. Here is a picture of masks I used today. (Sorry, they are dirty... because I took this photo after I finished my cards.) Right one is Kirigami which was made by me. 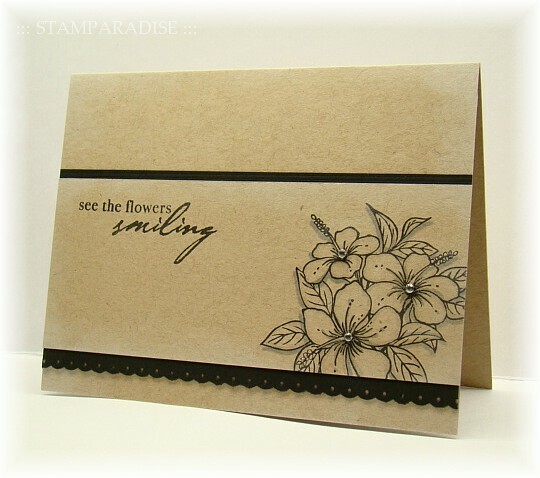 On the first card, I used label 8 nestabilities die and kirigami for masking. 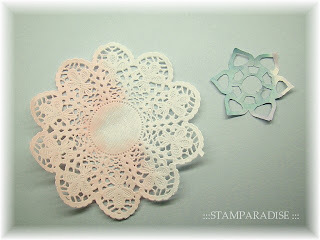 On the next card, a lace paper was used for masking. I'm very happy with the way these cards turned out! :) But, I don't like these photos... It is difficult to take a beautiful photo of whitish cards, isn't it?? To be honest, I don't like the card I made last night. But I'm showing it to you anyway. This card was based on the current sketch over the Card Positioning Systems (CPS170). 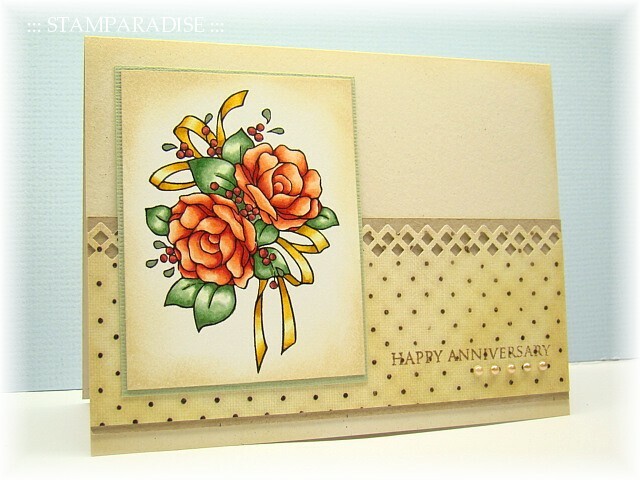 I alterd the shape of a card into a rectangle from a square, and used a lattice border punch instead of the big scallops on the sketch. I wanted to keep my card simple but this was too simple. I think I should have used textured cardstock as a cardbase or have added some ribbon. In addition to that, I was not satisfied with my coloring. Sigh... Anyway, tomorrow is another day! I'll make another card again!! The rainy season is coming soon here... I don't like it because it is muggy. But I wish I could enjoy a rainy day with my favorite umbrella and rain shoes. 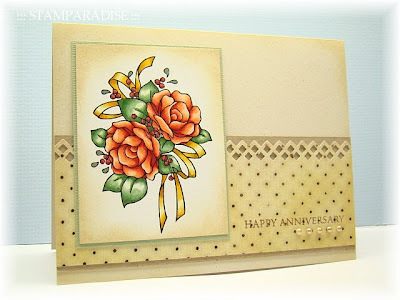 This card was used the Laura's Sketch 53 from 2 Sketches 4 You blog. I love this simple sketch! 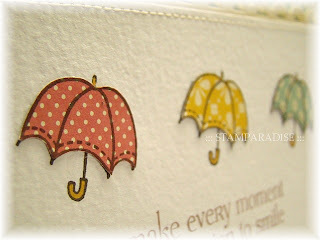 :) The umbrellas were stamped with Espresso ink (Versa Craft), and they were paper pieced. They are so cute, aren't they? And I can't help remembering a traffic light when I look at this color combo...LOL! Thank you for stopping by today! Have a nice weekend! Recently, I'm totally obsessed with CAS card! I combined two challenges for CAS card on this card, One-Layer Wednesday #7 (OLW7) and CAS-tastic Wednesday #6(CWC006). The theme of the OLW 7 is "Repetition", and the theme of the CWC006 is Focus on Sentiments". Both are so FUN, aren't they? I made a heart-shaped mask with a scrap of paper. After I stamped the sentiment with Brick ink (Versa Craft), masked it, and stamped the same sentiment repeatedly with Ash Rose ink(Versa Craft) to fill the heart shape up. 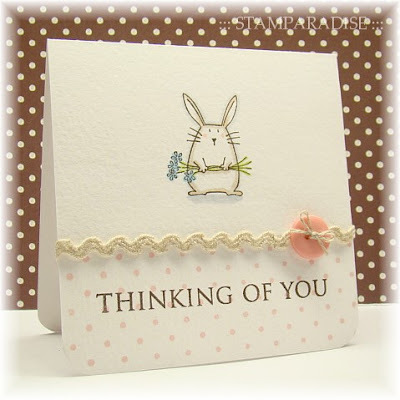 A couple of tiny rhinestones were added to complete the card. It looks simple and easy to make. But it took me about TWO hours to get this end result! I changed the size of the heart three times, changed the sentiment two times, changed the color combo some times, and changed the placement of the focal sentiment two times!!! The result is simple but the process was NOT simple...:( I didn't know if this result was the "Best", but I didn't have energy to try another possibility anymore...LOL!